Vitamin B12, also known as cobalamin, is a water-soluble vitamin that is important in the hematological and nervous systems, and it has a complex relationship with the skin. Altered cobalamin levels can lead to dermatological manifestations, which may indicate a deficiency or excess of this vitamin. The biochemistry and metabolism of cobalamin is complex, and diseases can be associated with alterations of this metabolic pathway. The cutaneous manifestations of cobalamin deficiency include hyperpigmentation (most commonly); hair and nail changes; and oral changes, including glossitis. 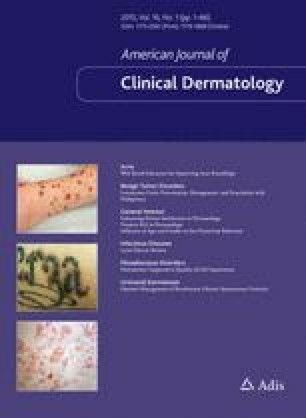 Additionally, several dermatologic conditions, including vitiligo, aphthous stomatitis, atopic dermatitis, and acne are related to cobalamin excess or deficiency. The cutaneous complications of cobalamin therapy include acne, rosacea, and allergic site reactions, or anaphylaxis with cobalamin injections. As cobalt is a component of cobalamin, patients with cobalt sensitivity have been reported to have cutaneous manifestations when receiving cobalamin replacement therapy. No sources of funding were used to prepare this review. Jennifer Brescoll and Steven Daveluy have no conflicts of interest that are directly relevant to the content of this review.